Timeless elegance can be found in this delicate classic Necklace with the wonderful combination of Diamonds and Pearls working beautifully together. 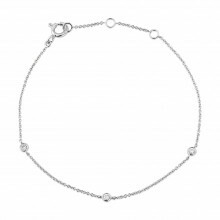 Round Diamonds are set into 18ct White Gold rub over collets and evenly spaced along a fine trace chain. A dramatic round Pearl hangs from the central Diamond and is linked to the fine trace chain. Matching Earrings are available.